I was trying to think of what I remember Utica for and it was the prison. Last edited by Arachnid on Thu Jun 13, 2013 10:27 pm, edited 1 time in total. So did you take care of her? Looks awesome! 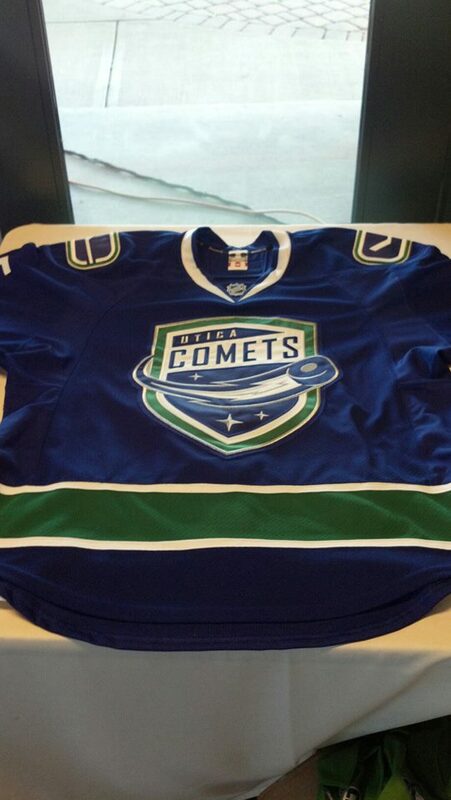 Glad they have the Canucks colours at least. It's a shame that the Canucks couldn't get their farm team playing at Prospera Place. Not sure how the Rockets would feel about this but it would make so much sense as the Flames are clearly playing hardball regarding getting the hell out of Abby. Hell why not have the Coilers move their farm team to Kamloops ? Not sure about the logistics of any of this but it would sure cut down on the travel for these teams and it would give fans a cheaper alternative for watching pro hockey. Maybe the Jets could move their farm team to Prince George. Calgary has not had success in Abbotsford and want more money to help the Heat but at the same time decided they could make the Canucks pay to have the team there. Backfired big time. Now Abbotsford won't let the Heat out and the Canucks will have the option in six years of moving the farm team there. Calgary actually wanted to be paid to move even though they had made rumblings about wanting to move before the Canucks came calling. The City wanted out from under their contract and the Canucks were willing to go there and take no money from the City. Concession issues were worked out from what I understand. Its all on Calgary playing hard ball and thinking the Canucks would pay a high price to have their farm team next door. I think the Canucks would have been prepared to pay something to help facilitate a Heat move but not extortion fees. The Canucks anticipate sold out buildings and reduced transportation costs having the farm team in the US. When the Heat contract expires and the utica contract expires the Canucks will have first chance at relocating then. And the utica contract has an out clause in it. Don't know the details but there is an out clause. The Heat have a sweetheart deal in Abby but they can't get fan support. Duh, no kidding. Why don't we put our farm team in Red Deer and see how much love they get? Hockey Widow wrote: Its all on Calgary playing hard ball and thinking the Canucks would pay a high price to have their farm team next door. I think the Canucks would have been prepared to pay something to help facilitate a Heat move but not extortion fees. Calgary forgot who they were fcukin with. Interesting Hot Stove last night, Friedman said Vancouver asked about Seattle and was told the rink wasn't available. Strong rumours of the Coyotes ending up there should problems in Glendale continue. The Flames have a sweetheart deal in Abby that they would be foolish to give up. I don't blame them one bit for not giving in to Vancouver on that one. Also talk on Bountiful and on Hot Stove of Shanny the media whore being brought in between Feaster and King. Is this similar to Feaster coming in between Dutter and King? Topper wrote: Interesting Hot Stove last night, Friedman said Vancouver asked about Seattle and was told the rink wasn't available. Strong rumours of the Coyotes ending up there should problems in Glendale continue. Yup where there's smoke! plan B is ready and set to go. "NHL commissioner Gary Bettman has been in contact with Seattle Mayor Mike McGinn. McGinn believes that Seattle can support an NHL team in KeyArena, which is the former home of the WHL Seattle Thunderbirds and NBA Seattle SuperSonics. Seattle might become the home of the Phoenix Coyotes if the NHL doesn't see significant movement towards the ownership saga being resolved in the coming weeks. Moving the team to Seattle would allow for the team to stay in the same post-realignment division and it would create a natural rivalry with the Vancouver Canucks. Source: Chris Daniels on Twitter "
Lets just move them already.